Thaw place was FANTASTIC and this is the place to stay in Yorkton. Central to Everything that You Need! Where to find Yorkton hotels near an airport? 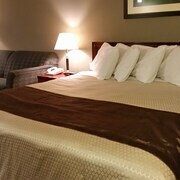 Where can I find hotels in Yorkton that are near tourist attractions? Yearning for the orchards of Yorkton? We invite you to savour the simplicity of this city in Saskatchewan. Discover spas, family-friendly attractions, and wide open spaces right at your doorstep. This bountiful city is waiting to show you how beautiful life can be in Canada's agricultural heart. Whether you’re in town for the Yorkton Film Festival or you're seeking a place to escape from the stress of reality, hotels in Yorkton offer pampered stays. Expedia offers the perfect escape from high rates on vacations. Stay right here to learn how to plan a fun, affordable holiday for the whole family. Yorkton has a friendly spirit. The downtown features a number of walking trails highlighting the historic, artistic, and silly dimensions of the city. Great local artisan shops make the city feel like an exotic trading post. Restaurants and public parks cater to the needs of adventure-seeking families. Winter and summer tell two very difference stories in Yorkton. Snowmobiles zip around the city when freezing temperatures and abundant snowfall dominate the land. The city even provides routes for snowmobiles to access main attractions. Summers are sunny and warm. Expect the thermostat to linger near 18 degrees Celsius as you explore fun trails in July. Spring and autumn are typically short and mild. 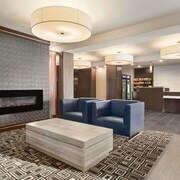 As new seasons sculpt renewed landscapes throughout the year, Yorkton hotels fill up with excited travellers. Be sure to visit the Ravine Ecological Preserve, the Western Development Museum, and York Lake Regional Park while you’re here. The city hosts a number of festivals to mark various harvests throughout the year. The Painted Hand Casino provides sophisticated fun for adults. Your next great souvenir is waiting inside one of the city’s many quaint art galleries. Of course, you can pick up some memorable travel deals on Expedia.ca right now. 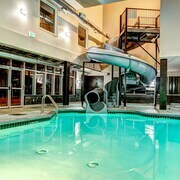 Discover cheap rates on Yorkton Saskatchewan hotels near top attractions using the tools on Expedia.ca today. Our all-inclusive packages make squeezing flights to Yorkton into your budget so easy. Talk to our travel experts today to learn the tricks to snagging cheap accommodations and excursions. Are you ready to enjoy a holiday in a place where fruit hangs from the trees like glistening jewels? Act fast to book the best prices before other travellers pluck our deals. 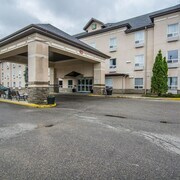 Are there hotels in other cities near Yorkton? 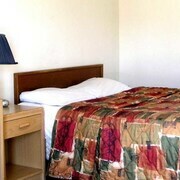 What other types of accommodations are available in Yorkton? Explore Yorkton with Expedia.ca’s Travel Guides to find the best flights, cars, holiday packages and more!